Following the overthrow of the constitutional monarchy of Queen Liliʻuokalani on January 17, 1893, the Committee of Safety established the Provisional Government of Hawaiʻi as a temporary government until an assumed annexation by the US. From January 6 to January 9, 1895, patriots of the Kingdom of Hawaiʻi and the forces that had overthrown the government were engaged in a war that consisted of three battles on the island of Oʻahu, Hawaiʻi. This has frequently been referred to as the “Counter-revolution”. It has also been called the Second Wilcox Rebellion of 1895, the Revolution of 1895, the Hawaiian Counter-revolution of 1895, the 1895 Uprising in Hawaiʻi, the Hawaiian Civil War, the 1895 Uprising Against the Provisional Government or the Uprising of 1895. Click HERE for a link to a prior post on the 1895 Rebellion. During the afternoon of January 7, several of the rebels were captured, and it was learned that the insurgents were under the command of Robert Wilcox and Samuel Nowlein, with Carl Widemann, WHC Greig and Louis Marshall as Lieutenants. Wilcox had received military instruction in Italy during the days of King Kalākaua (he previously led a rebellion in 1887.) Nowlein served in the military under the Monarchy, and after the overthrow of 1893 had lived at Washington Place as a retainer of the ex-Queen. Widemann was the son of a judge (who was one of Liliʻuokalani’s Commissioners to President Cleveland. Greig and Marshall were young clerks in business houses in Honolulu. On January 14, Nowlein, Widemann, Greig and Marshall surrendered themselves to the authorities, and during the afternoon Robert Wilcox was captured in the outskirts of the city. On the forenoon of January 16, Deputy Marshal Brown and Senior Captain Parker of the police force served a military warrant on the ex-Queen at her Washington Place residence. The trials were held in the Legislative Hall of the Executive building and were open to the general public, special accommodations also being made for the attendance of the diplomatic corps. The Judge-Advocate stated that martial law is a law of necessity, in which the question of necessity rests in the discretion of the Executive and nobody can call it in question. The right had been exercised; there was nothing more to say. During its session of thirty-six days, 191-prisoners were brought before the Commission. The most prominent persons were ex-Queen Liliʻuokalani and Prince Kūhiō. Some were acquitted, others found guilty; by January 1, 1896, the last of the prisoners was released from prison, typically under conditional pardons. The trial of the last case brought before the Commission ended March 1; however, the Commission did not adjourn until March 18, 1895 and the martial law was lifted. The image shows the proclamation of martial law, signed January 7, 1895. On a cold Saturday afternoon November 19, 1892, Oberlin’s Yeomen football team took the field in Ann Arbor against the heavily favored Michigan Wolverines (which had trounced them handily the year before.) Oberlin’s new coach, Johann Wilhelm Heisman, brought an undefeated team with him to Ann Arbor. OK, back to Oberlin and their fateful game. 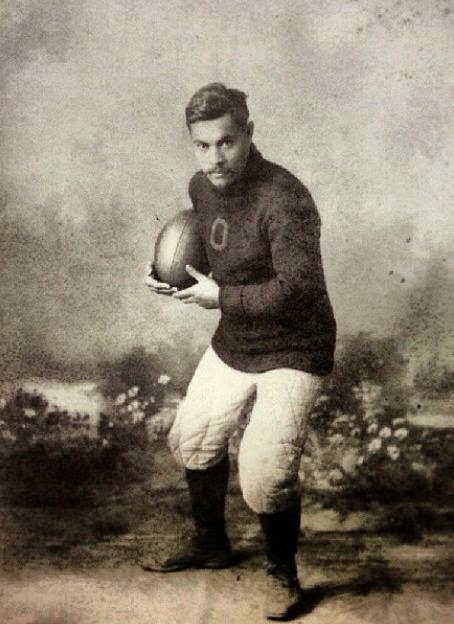 It is believed Wise was the first Hawaiian to participate in college football. He was considered their best lineman. It’s not clear what the ‘official’ outcome of the game was. The team captains agreed on a shortened second half, to end at 4:50 pm, so Oberlin could catch the last train home. With less than a minute to go it was Oberlin 24, Michigan 22. As Michigan launched its last drive, the referee (from Oberlin) announced time had expired, and the Oberlin squad left the field to catch the train. But being the first Hawaiian to play college football is only part of Wise’s legacy. When Wise returned home in 1893, the Islands were in turmoil – Queen Liliʻuokalani was overthrown and a Provisional Government had been formed. Wise became a key member of the resistance, helping plan a January 1895 counter-revolution to restore Queen Lili‘uokalani to the throne by force. From January 6 to January 9, 1895, patriots of the Kingdom of Hawaiʻi and the forces that had overthrown the constitutional Hawaiian monarchy were engaged in a war that consisted of battles on the island of Oʻahu. It has also been called the Second Wilcox Rebellion of 1895, the Revolution of 1895, the Hawaiian Counter-revolution of 1895, the 1895 Uprising in Hawaiʻi, the Hawaiian Civil War, the 1895 Uprising Against the Provisional Government or the Uprising of 1895. In their attempt to return Queen Liliʻuokalani to the throne, it was the last major military operation by royalists who opposed the overthrow of the Kingdom of Hawaiʻi. The goal of the rebellion failed; Wise and over three hundred royalists (including Prince Kūhiō) were arrested. In December 1918, the association’s legislative committee finalized the draft of a “rehabilitation” resolution. Wise (who was serving as Territorial Representative (and later as Senator)) introduced it when the Territorial legislature opened in January 1919 – this set the foundation for the legislative effort to have the Hawaiian Homes Commission Act passed by Congress. By April 25, 1919, the Territorial House of Representatives passed the resolution, and Wise was appointed to a Territorial Legislative Committee responsible for carrying the Territory’s legislative package to Congress. The effort to pass the Hawaiian Homes Commission Act took from December 1918 to July 1921; on July 9, 1921, the bill passed both houses of Congress and was signed into law. The US Congress set aside close to 200,000-acres of former Crown and Kingdom lands for exclusive homesteading by Hawaiians of at least half Hawaiian ancestry. It called for the formation of the Hawaiian Homes Commission to administer the homesteading program and noted that lands would be parceled out for homesteading under 99-year leases at a charge of $1 per year. Wise retired from politics in 1925 and took up the quiet life of a farmer on Moloka‘i, where he raised pigs and grew taro. But he soon returned to Honolulu – there, he helped restore Hawaiian language instruction at his alma mater, Kamehameha Schools. The image shows John Henry Wise. In addition, I have added other images in a folder of like name in the Photos section on my Facebook and Google+ pages. A busy life … Teacher, Noble, Legislator, Newspaper Publisher, Italian Military Trainee, Surveyor, Revolutionist, Royalist, Counter-Revolutionist, Prisoner, Home Rule Candidate, Hawaiʻi’s First Congressional Delegate … he died October 23, 1903, at the age of 48. He was born February 15, 1855 on the island of Maui. Hapa – his father was a native of Newport, Rhode Island; his mother, a native of Maui, a descendant of royalty. He first went to school at Wailuku at the age of 8 years. When he was 10 years old his mother died, then his father moved to ranching at Makawao. There was no English school at Makawao until 1869. That year, the Board of Education established the Haleakalā Boarding School; he was one of the first students at that school. Upon completion of his studies, he became a teacher at ʻUlupalakua. In 1880, he was elected to the Islands’ legislature; he represented the citizens of Wailuku and its neighboring Maui community. King Kalākaua sent Wilcox to Italy to receive military training at the Royal Military of Turin, at the expense of the Hawaiian government. There, he married the first of his two wives, Signorina di Sobrero, an Italian. Later, he and his wife moved to San Francisco in 1888 and he worked as a surveyor for the Spring Valley Water Works Co. Wilcox came back to the Islands in 1889 and his wife returned to Italy. On July 30, 1889, Wilcox led a rebellion to restore the rights of the monarchy, two years after the Bayonet Constitution of 1887 left King Kalākaua a mere ﬁgurehead. By the evening, he became a prisoner and charged with high treason by the government. He was tried for treason, but was acquitted by the jury. In 1890, he was elected to the Legislature in the Islands. Following the overthrow of Queen Liliʻuokalani in 1893, the Committee of Safety established the Provisional Government of Hawaiʻi as a temporary government until annexation by the United States. In their attempt to return Queen Liliʻuokalani to the throne, it was the last major military operation by royalists who opposed the overthrow of the Kingdom of Hawaiʻi. The goal of the rebellion failed. Wilcox was court-martialed and sentenced to death, but the sentence was commuted to thirty-five years. While in prison in 1895, Pope Leo XIII granted an annulment of their marriage. The Italian Consul and the Catholic Bishop at Honolulu confirmed this action. In January, 1896, he was given a conditional pardon and became a free man; later that year, Wilcox married again, this time to Mrs. Theresa Cartwright. In 1898, President Dole gave him a full pardon. Wilcox and others formed the Independent “Home Rule” Party and Wilcox ran as a candidate for the Delegate position (against Republican Samuel Parker and Democrat Prince David Kawānanakoa.) Wilcox won, and served as the first delegate and representative of Hawaiʻi in the US Congress. 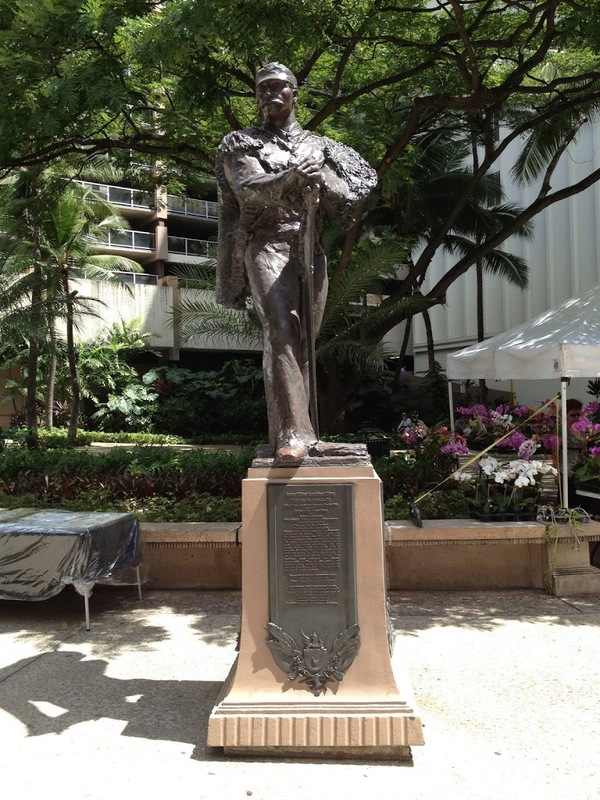 The image shows a statue of Robert Wilcox at Fort Street Mall and King Street in downtown Honolulu. In addition, I have included other related images in a folder of like name in the Photos section on my Facebook and Google+ pages. Following the overthrow of Queen Liliʻuokalani in 1893, the Committee of Safety established the Provisional Government of Hawaiʻi as a temporary government until an assumed annexation by the United States. From January 6 to January 9, 1895, patriots of the Kingdom of Hawaiʻi and the forces that had overthrown the constitutional Hawaiian monarchy were engaged in a war that consisted of three battles on the island of Oʻahu, Hawaiʻi. The chief conspirators who conducted the planning were four: CT Gulick, a former Cabinet Minister of Kalākaua, an American; Samuel Nowlein, a hapa haole, former Captain of the Queen’s Guard; WH Rickard, an Englishman long resident in Hawaiʻi; and Major Seward, an American long domiciled with John A Cummins, a wealthy hapa haole. For three months, these four held frequent meetings at Gulick’s house and settled upon a plan for the capture of the city and public buildings. Capt. Nowlein was to be commander of the rebel forces. Major Seward was to procure arms, Rickard was generally useful and Gulick was the statesman of the party. Gulick, with the others, drew up a new Constitution, wrote a Proclamation restoring the Queen’s Government and prepared written Commissions for a number of chief officials. They received two cases containing eighty pistols and ammunition which they first buried on the islet, but afterwards carried to Honolulu. The schooner then lay off outside for twelve days. On the 28th, the little steamer Waimānalo was chartered by Seward and Rickard, and on New Year’s Day intercepted the schooner about thirty miles NE of Oʻahu, and received from her 288-Winchester carbines and 50,000-cartridges. Captain Nowlein had secretly enlisted Hawaiians in squads of thirty-eight. About 210 of them assembled at Waimānalo during Saturday night and Sunday, the 6th. They captured and detained all persons passing or residing beyond Diamond Head. Robert Wilcox, of former insurgent fame, had joined the rebels, and was placed in command under Nowlein. Beginning on the night of January 6, 1895, several skirmishes ensued, with slight victory for the Royalists. However, their benefit of surprise was now lost and they were out-numbered and out-gunned. On January 7, 1895 martial law was declared in Hawaiʻi by Sanford B Dole. Three major battle grounds were involved. First, Wilcox and about 40 of his men were on the rim and summit of Diamond Head firing down on the soldiers. 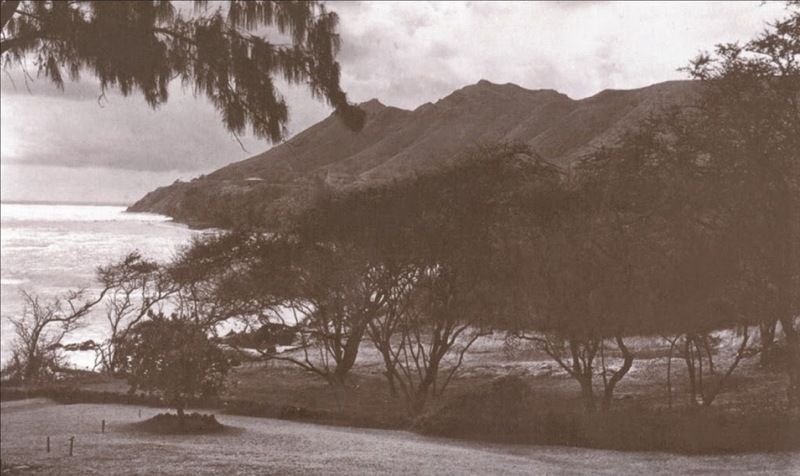 Seeing no tactical importance in remaining on Diamond Head, Wilcox ordered his men to retreat to Waiʻalae. The new strategy was to move north into Koʻolau mountains then west, avoiding the Government forces in the south. 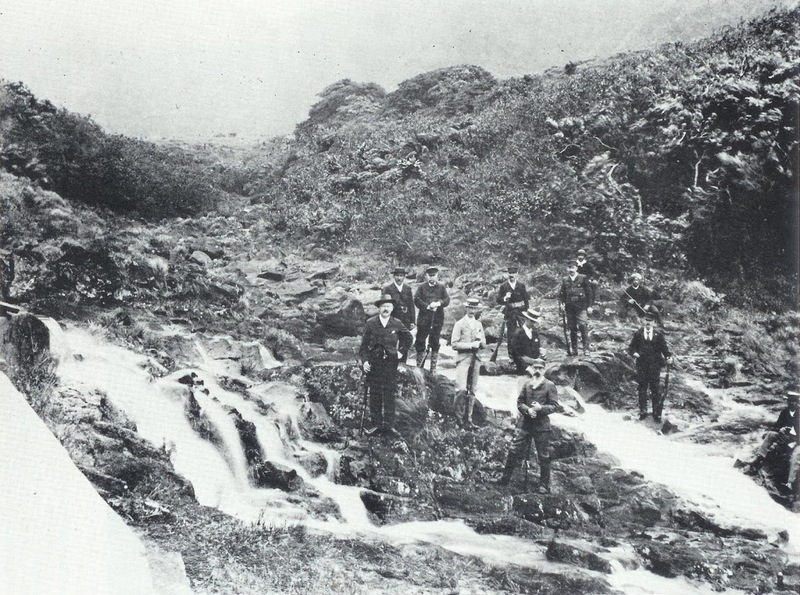 Wilcox and his men then escaped up a trail on the precipice to the ridge separating Mānoa from Nuʻuanu. On that ridge his men dispersed into the mountain above; Wilcox and a few others crossed Nuʻuanu that night, eluding the guards. Some 400 of the Government forces guarded the valleys from Nuʻuanu to Pālolo for more than a week, and scoured the mountain ridges clear to the eastern Makapuʻu point. This resulted in the capture of all the leading rebels. As evidence against conspirators accumulated, some forty whites and 120 Hawaiians were arrested. Four foreigners and 140 Hawaiians were taken prisoners of war. The prisons were supplemented by the use of the old Barracks. Liliʻuokalani was put under arrest on the 16th, and confined in a chamber of ʻIolani Palace. A tribunal was formed and evidence began to be taken on the 18th. Nowlein, Wilcox, Bertelmann and TB Walker all pleaded guilty, and subsequently gave evidence for the prosecution. On January 24, 1895, in an effort to prevent further bloodshed, Liliʻuokalani executed a document addressed to President Sanford B Dole, in which she renounced all her former rights and privileges as Queen and swore allegiance to the Republic. The president pardoned the royalists after serving part of their prison sentence. After her release from ʻIolani Palace, the Queen remained under house arrest for five-months at her private home, Washington Place. For another eight-months, she was forbidden to leave Oʻahu, before all restrictions were lifted. Lots of the information here comes from an article in The Friend, February, 1895. The image shows a counter-insurgency patrol of Citizens’ Guards after the Battle of Mānoa. In addition, I have added other related images in a folder of like name in the Photos section on my Facebook and Google+ pages.